Because I like to eat, I like to cook. But I’m older, wiser, and my children are grown, so I only touch a pan once or twice a week. And during the summer months when Studley grills outside, I can go an entire month without opening a single cookbook. That’s just another advantage of tumbling down the far side of fifty without a spatula. When my children were small and I worked full-time, I would rush home and slap together a concoction that contained at least two of the four food groups. Chipped beef on toast was my gourmet specialty. To add fruit and a vegetable, I’d smear strawberry jam on celery. Now my kids bemoan the fact that after they grew up and moved away in search of healthy food, I quit my job and enrolled in cooking classes. If I want my grown children to come for a visit, I call and say I’m making curried prime rib or authentic chicken parmesan. They’re at the door before I turn off the phone. Years ago I grabbed an apron and joined a cooking tour of Italy through an organization called A Cook’s Tour. The trip featured hands-on lessons with professional Italian chefs. Best of all, we ate our sumptuous meals outside on long tables under flowering trees in the orchard. Of course, the meals included abundant selections of wines. That’s where I fell in love with Amarone – not an Italian lover but a vibrant red wine that captured my breath and my heart. 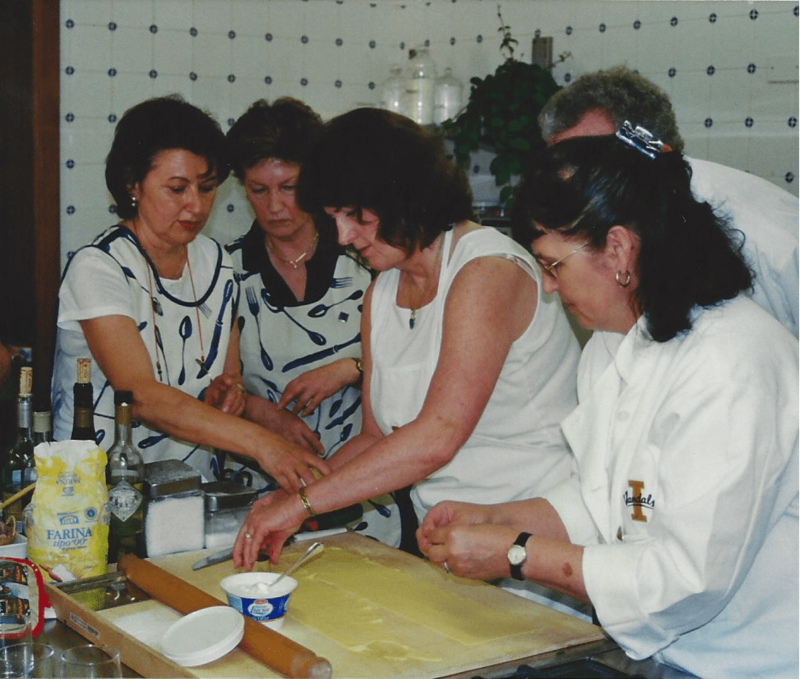 At the cooking school, I learned to make ravioli and cappelletti (little hats) with chefs Antonia Montrucoli and Giulianna at the the Villa Serego Alighieri near Verona. The property was surrounded by vineyards, olive trees, and fruit orchards and has been in the family of the great Italian poet Dante Alighieri (Dante’s Inferno) since the year 1353. I truly considered losing my passport and staying there as an apprentice chef and troubadour. There are two secrets to preparing magnificent Italian food: fresh local ingredients and time. Start with extra-virgin, first cold-pressed olive oil from the friendly neighbor. Then add juicy tomatoes, fresh basil, garlic, onions, and green and red peppers from the garden. Keep a selection of fine cheeses in the cooler and bowls of melons and lemons on the counter. Be sure to open some wine while you assemble the ingredients. I love cooking with wine, and sometimes I add it to the sauce. As the red sauce (NOT spaghetti sauce) simmers and the flavors blend, you must wait for the magic to happen. This could take hours because you can’t rush an exquisite Italian sauce. This gives you time to sip wine, bake a loaf of crusty bread, and arrange olives and assorted cheeses on a platter. Then enjoy a festive meal with friends and celebrate buen appetito! I cooked chicken parmesan this week, so I’m off duty for awhile. Studley and I eat salads during the week and add some protein. It’s just the two of us, so we keep it easy. It’s truly the joy of cooking made simple. And if I ever return to Italy, I’ll find the Villa Serego Allighieri and raise a glass of Amarone to pay my respects to Dante. His Inferno is part of his most famous work, Divine Comedy. The title sounds like the recipe for my life. Fresh food beautifully made. Yep, great Italian food. Love it. Normal “chores” are so much more fun when we get to pick when and how we will perform them! We do the salad + protein (usually something grilled) for dinners too. Steve has an awesome vegetable garden…gosh, this is so much easier than cooking for a family. Like a different experience. Plus wine. Not that there wasn’t wine before, but more wine now! It is so early but you have made me very hungry and inspired me to get moving, raid my neighbors garden (never got mine in this year:( ) and put on some sauce. My husband will be thrilled. You know, cooking school sounds fun….but then I think about actually cooking, and I say, nah! Sounds wonderful, though (the end result!). This sounds lovely. I’m very impatient in the kitchen, which probably explains why I’m not a very good cook! Oh, man. Now I’m hungry!!! I am the reverse of you! In my early college years I moved out of the dorm and became a vegetarian. A dear friend and I were in a wonderful bookstore in West Lafayette, Indiana, called Von’s and I bought a copy of The Moosewood Cookbook. I discovered I had a knack for cooking rich eggy and cheesy dishes. Then I discovered the food of the Spanish, Italian, and Greek cultures. It is amazing what fresh spices, garlic, good olive oil, and flavor rich tomatoes can create! Then I had a child in my 30s. Yikes. I purchased packaged food. Celery, peanut butter, and strange sandwiches were my daughter’s packed lunches, along with sliced green peppers and yogurt. I hope I return to real cooking occasionally as you have done now that it is just Hubby and I. Oh, and my daughter? She now is a meat and potatoes kind of girl!